Having written about nostalgia and re-enactment – and earlier about cycles of retro – I've just been pointed (thanks, Jess!) to this New Yorker piece by Adam Gopnik, who identifies a 40-year lag between history as experienced, and as re-enacted. Gopnik argues that this happens because the creators and gatekeepers of pop culture are largely in their forties. "Forty years past is the potently fascinating time just as we arrived, when our parents were youthful and in love, the Edenic period preceding the fallen state recorded in our actual memories." And so, if we can hang on, it will be in the twenty-fifties that the manners and meanings of the Obama era will be truly revealed: only then will we know our own essence. A small, attentive child, in a stroller on some Brooklyn playground or Minneapolis street, is already recording the stray images and sounds of this era: Michelle’s upper arms, the baritone crooning sound of NPR, people sipping lattes (which a later decade will know as poison) at 10 A.M.—manners as strange and beautiful as smoking in restaurants and drinking Scotch at 3 P.M. seem to us. A series or a movie must already be simmering in her head, with its characters showing off their iPads and staring at their flat screens: absurdly antiquated and dated, they will seem, but so touching in their aspiration to the absolutely modern. Forty years from now, we’ll know, at last, how we looked and sounded and made love, and who we really were. It will be those stroller children’s return on our investment, and, also, of course, a revenge taken on their time. Gopnik is onto something. There is already a movement to post online the youthful images of one's parents – and even grandparents or other ancestors – and to appreciate their clothes, their hairstyles, and their attitudes as cool and chic by today's standards. Perhaps this identification with one's parents (before they were parents) is an attempt to find a personal connection to the past that doesn't rely on one's own memories. It's literally intergenerational nostalgia. When I see my friends posting pictures of themselves with their young children on Facebook, I imagine myself as those kids all grown up, looking back nostalgically at how happy and beautiful their parents were, unaware of how these dudes, my friends, are just getting through their day-to-day lives. It makes me melancholy. 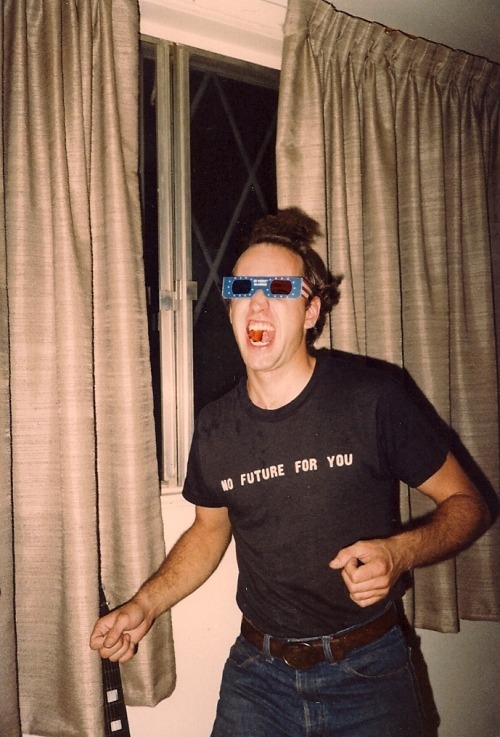 This image (from Dads Are The Original Hipsters) is undated, but the slogan on the T-shirt sounds like a riff on the Soup Nazi from Seinfeld – wittily contemporary, yet ominously true. Do we have no future when we constantly look to the past? Yesterday, April 25, was Anzac Day, an Australian and New Zealand national holiday to commemorate war dead. Ideologically it's best compared to the US's Memorial Day, as it arose from a specific conflict (in this case, oddly, a disastrous military blunder in April 1915 that unnecessarily claimed tens of thousands of lives) yet has become generalised as an event of national remembrance in a way that, ironically, Remembrance Day has not. But Jeff Sparrow's current essay at Overland begins with a contentious claim: "Anzac Day celebrates forgetting." For Sparrow, the political context of World War I has been almost entirely forgotten by an Australian population that thinks of war as a specific brand of hellishness utterly removed from everyday life, calling on a form of courage and sacrifice utterly lacking in civil affairs. Hence, it requires a response of horror and attempted empathy, rather than social or political critique. For me Sparrow isn't really speaking of aestheticising the past, but of phenomenologising it: seeking an understanding of how it felt to live through the past. This is a key aspect of my project, because clothing fit is so clearly about phenomenology – about the experience of wearing clothes, as well as how one looks in those clothes. However, Sparrow's article has given me pause about whether the desire to empathise with the past is a worryingly anti-political gesture that evacuates the past of its context, filling it instead with today's political imperatives (even if that is, as Sparrow argues in this case, a political imperative to 'forget politics'). We are driven to re-enact things rather than to analyse or question them, because as Sparrow argues, "the question ‘what did it feel like?’ always implies a follow-up: ‘I wonder what it would be like.’"
There are, of course, many military re-enactment groups who gather on weekends to play out famous battles, and medieval or Renaissance groups who compete in mock-tourneys. On a wider level, many people re-enact favourite historical periods in their everyday lives by consuming goods from those periods – as 'commodity nostalgia'. I've thought a fair bit about nostalgia. In 2010 I wrote an essay on whether there is an ethical dimension to nostalgia, or whether it is always anti-political, or politically conservative. And in 2009 I wrote an op-ed on Mad Men theme parties as nostalgic events. In it I mentioned an exhibition of Australian modernist design from 1917-1967 that was showing at the time. At a public forum discussing the influence of modernism on design today, industry heavyweight Garry Emery remarked that people today focus on the aesthetics of modernism without considering its political aims (which ranged from utopian to iconoclastic). I might also highlight the irony of this disconnectedness – that a design philosophy based on functional rather than aesthetic principles has come to be appreciated for its aesthetics alone. But I mention it here as it seems uncannily to foreshadow Sparrow's contention that, viewed retrospectively, aesthetics are anti-political. I feel anxious now about those words "mastery over the past", because I don't believe it's a good thing to feel that the passage of years allows us to understand history more perfectly than the people of the past understood it at the time. Who gets to be the expert on, say, corsets? Us, examining them in museums and in old advertisements and magazines, or dressing up in them for special events? Or the women who wore corsets on an everyday basis, the way we wear bras? If you're interested in historical dress, Disney or Tumblr, you have probably already come across Claire Hummel's illustrations in which she reinterprets the Disney princesses in outfits that are historically appropriate to the time when the films are set. I came across them last year in one of those un-annotated Tumblr photosets whose origins were lost several hundred reblogs ago, but I've only just discovered Hummel's thoughtful, well-researched rationales for her choices. That's Belle from Beauty and the Beast, obviously. What I like about the images is that Hummel has worked hard to keep the recognisable tropes of the characters intact, while being imaginative about their historical contexts. 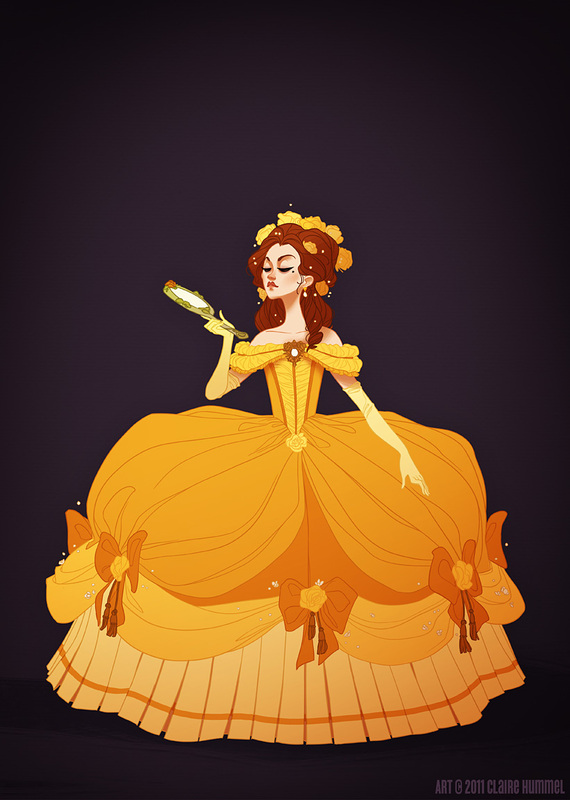 "Beauty and the Beast has always hovered hesitantly in the late 18th century (especially in the earlier concept art), so I redid Belle's gold dress to match 1770's French court fashion," she writes of this image. It's fascinating stuff because the Disney films are already such 'impure' texts, with such hazy evocations of time and place, full of anachronisms and anatopisms. Of Mulan, Hummel says, "pinning down her time period stopped being fun and rapidly became a headache- you have the original legend taking place in the Wei Dynasty, the Huns as an actual threat during the Western Han Dynasty, the Forbidden City of the Ming Dynasty, the hanfu fashion setting it earlier AGHGHGhjffjhfghgjhkh". And of Pocahontas: "the shell necklace should in theory be a deep purple (turquoise is a much more Southwestern commodity), but you lose so much of the Pocahontas visual identity without the splash of teal around her neck." The project throws an agreeable doubt blanket on the entire idea of 'historical accuracy', about which it's really easy to get pedantic. At this stage, at least one chapter of my book will discuss ill-fitting clothes in popular culture, from Cinderella to The Incredible Hulk. But I'm already running into trouble when it comes to contemporary texts set in past eras. For a historian, it's reasonable to conclude that the attitudes towards size and fit displayed in a book, a film, a TV show, a comic book, etc, are those of the time the text was created. These change over time as texts are remade by new generations. For instance, think of the way the Batsuit has changed from Adam West's almost vulnerable-looking leotard and satin undies to Christian Bale's carapace-like Kevlar armour. And take a look at my old post comparing Honor Blackman's catsuit in the 1960s Avengers to Uma Thurman's in the 1998 movie. But when it comes to period-set texts, we have a certain suspension of disbelief. We're prepared to take the author, the screenwriter, the production designer and costume designer's words for it that we are seeing an 'authentic' representation of a particular era. Jane Austen's Pride and Prejudice was published in 1813. They've got Darcy's look down okay, but Lizzie looks absolutely wrong. Her hairstyle is totally '40s with the upper hair in a smooth puff and lower hair in rolls curled towards the neck, whereas fashion plates and portraits of the early 19th century depict a chignon on the back of the head with small ringlets softly clustering around the temples. I also want to include this image to show that while we tend to think of 'Regency fashions' as being relatively stable over time, they altered just as fashion always has and still does. In the image on the far right, you can see the migration of the waist closer to its natural point, and the broadening of the skirt to a bell shape. And here is the dress Mia Wasikowska wore in last year's Jane Eyre (costume by Michael O'Connor). 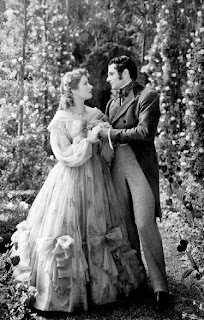 Jane Eyre was published in 1847 but Jane's wedding took place several years earlier than her narrative. As I wrote a few years ago in a feature article about period film casting, "what we really seek from contemporary historical cinema are emotional truths: impervious to anachronism, resonating down the ages to reassure us of the universality of human experience." In the service of this universality, costuming is often used as narrative metaphor. For instance, contemporary period dramas often use corsetry and voluminous dresses to mimetically convey women 'trapped' or 'subjugated' by class and marriage (for instance, in Marie Antoinette, Titanic and The Duchess). …and she has to plead "a women's thing" (which isn't actually a lie – wardrobe malfunctions are often presented as a feminine failing) to avoid the humiliation of being seen to have gained weight. and is promptly zipped up by Don, cementing that Megan has just as easily slipped into Betty's place at his side. What makes this juxtaposition quite unfair, however, is the issue of ease. Betty's dress is super-fitted, whereas Megan's is loose through the dropped waist. Later, at the doctor's office, Betty wears a horrible, boxy synthetic knit jacket. "Betty Draper – I almost didn't recognise you!" says an acquaintance who runs into her. Throughout the episode, Betty wears garish housedresses and dressing gowns in bright synthetics, as opposed to the cool pastel palette and sleek, fitted lines she wore in the show's earlier seasons. Universality aside, I really appreciated a line of dialogue in which dropping a few pounds is referred to as "reducing" rather than the more familiar (to our ears) "slimming" or "weight loss". I've just finished reading Calories and Corsets, Louise Foxworth's excellent cultural history of dieting, in which she extensively quotes diet books and advertisements going back centuries. While reading the book I was struck by the way "reducing" or even "reducing flesh" was a favoured 19th- and 20th-century turn of phrase, and so I was pleased to see it in Mad Men. A large part of my project is investigating retro and vintage fashion practices – that is, why people prefer the styles of the past over what's currently fashionable. 'Retro' and 'vintage' are often used interchangeably in mainstream culture; let me explain the differences I see between them. I see 'vintage' as a specific retail fashion system that gleans original garments from past eras and sells them in boutiques, auctions, markets and fairs. For the shopper, the value of vintage is knowing the garment is authentically of a particular time, with a particular provenance. Similarly to the antiques market, the vintage fashion aims to capture and preserve past eras through the garments themselves. Pardon my pun, but it's also a material culture, in that it's interested in a garment's industrial context – its fabrics, its labels, its designers, its manufacturers – that makes it representative of its time. By contrast, 'retro' is an ethos as well as a retail logic. I argue that people who consume 'retro' are attracted to the overarching aesthetic of a past era – and an accompanying set of feelings and cultural associations – so authenticity is less important than semiotic fit. If you're 'into retro', or a member of a retro-oriented subculture, you learn to seek out contemporary objects and experiences that look and feel like those of the era you love, even if they're not made the same way. While you ultimately prefer original stuff, reproduction stuff is okay too. At the moment I'm interested in home sewing as an expression of these ideas. A vintage-oriented maker might be more likely to choose original clothing patterns, construction techniques, and fabrics and trims authentically of the right period. It would be very important to this maker to create a close replica of an authentic vintage garment. On the other hand, a retro-oriented maker might be more likely to choose a contemporary pattern that just has a retro look, and more likely to alter it so it has a retro 'spirit' but is not entirely faithful to the way authentic vintage dresses would look. Of course, these are just hypotheses at the moment. To make a start on excavating these issues, I've created a survey on size and fit in retro and vintage sewing. It only has ten questions and so is a very blunt tool, but I'm hoping it will lead me in directions that clarify my ideas, and will help direct my more in-depth interviews. If you make your own clothes – either to vintage patterns, or to obtain a retro look – please help me out by completing the survey. And please feel free to forward the survey link to anyone you know who makes their own vintage or retro clothes. It's anonymous, but you have the option to leave your name so your comments can be credited in my finished book.